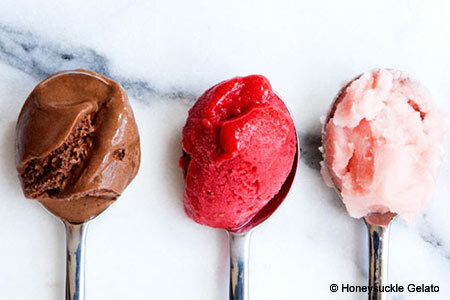 A Southern take on gelati includes regional flavors at this Ponce City Market shop. : Jackson Smith, Wes Jones and Khatera Ballard capitalized on Smith's experiences with a noted gelati-making chef in New York City. Smith's trips home to Atlanta became increasingly focused on bringing back gelati for family and friends, so he returned there and launched the enterprise. To date, Honeysuckle has made about 200 flavors, the majority of which are gluten-free. We like the sea salted caramel and such Southern flavors as bourbon pecan, watermelon sorbet and honey fig. Toasted coconut, reminiscent of a Southern coconut cake, mint julep and banana peanut butter caramel are other favorites. At this Ponce City Market outlet you can get a scoop, an ice cream sandwich, a shake or a cone as well as take home a pint of your favorite flavor. Many restaurants offer the gelati on their dessert lists.